Archive of 2003 PNC Info. 12/30/03 - The January 2001 issue of Coil Line is now online in the 'Reference' section. The index for 2000 has also been posted. 12/27/03 - Today we reached the 100,000 visitor mark. Thanks to everyone for your support and contributions. 12/23/03 - Dr. Robert Rabinowitz reports that he has seen plate 1111A on the BEP 37� U. S. Flag. The new number has been added to all the affected pages. 12/16/03 - Dr. Robert Rabinowitz sent a scan of the leader strips with the horizontal bar. The strips appear to be longer than those from the first printing. Click here to see the scan. 12/15/03 - Frank Covey sent a scan of the Sennett 'Stick' 37� U. S. Flag coil in a stick of 10. Dr. Robert Rabinowitz notes that one or more of the ten attached coils of 100 has a horizontal black 3 mm x 12 mm bar near the left edge. I don't have a scan available yet. Scott Publishing Company has assigned number 3770 to the Avery Dennison printing of the (10�) Atlas coil of 10,000. 12/12/03 - While cutting plate S3333 on the Sennett 'Stick' 37� U. S. Flag coil to make vertical blocks, I discovered that the tabs holding the coils together are spaced differently than on plate S1111. Click here to see the detail page with the differences. 12/9/03 - Renate Fearonce in Tucson writes to send her latest inventory list and to say she has plate 9999 on the 37� U. S. Flag. 12/8/03 - PNC3 member / dealer Jerry Koepp, dba Stamps 'n' Stuff, has been added to the dealer page. If any other dealers who are members wish to be added, send Ron an email. As of today, the counter at the bottom of the page is showing almost 98,000 hits. At the current rate, we will hit the 100,000 mark before the end of the year. 11/26/03 - The December 2000 issue of Coil Line is now online in the 'Reference' section. 11/21/03 - Donna Rajotte in Providence announces that she has plate S3333 on the 37� U. S. Flag. 11/19/03 - Alan Thomson reports that plate S3333 has been found on the 37� U. S. Flag in the same stick format as S1111. S2222 has not been reported. 11/13/03 - Additional data has been posted to the Ashton Potter (5�) Seacoast page. 11/12/03 - Alan Thomson announced that he received a report of the (25�) American Eagle with plate S3333333 on cover. Thanks to Herb Holmes for catching the typo. Boris Momiroff called my attention to the mis-spelling of Pantone on the Glossary page. Pantone produces the printing industry standard color charts and has a website at www.pantone.com. 11/11/03 - The results of our PNC3 auction #29 which ended October 25, 2003 are now posted online. All the auction information can be accessed by using the 'Membership' button, or by clicking here. Thanks to Auctioneer Joe Sedivy for another successful auction. 11/10/03 - Scott Publishing Company has assigned number 3829 to the 37� Snowy Egret coil stamp. Renate Fearonce in Tucson writes to say she has new stock including the 23� George Washington with plate V36, the (10�) Atlas coil of 10,000 with plate V11111, and the 5� Seacoast, P1111, psa coil of 10K, blue top and bottom back numbers, position 2/4. Back numbers are oriented correctly and are not upside-down. Position 2/4 only shows up every 220 stamps. 11/8/03 - Updated - Mike Lipson sent a couple of examples of a Die Cut Downward Shift and a Bottom Bell Die Cut on the 37� Snowy Egret stamps. These are included on a new page showing peak/valley and valley/peak die cuts on the Snowy Egret coil. A link is also near the bottom of the table on the data page. I have posted scans of the new Avery Dennison printing of the (10�) Atlas coil of 10,000 first reported by Donna Rajotte. 11/5/03 - I've received additional input about the tagging from Rich Nazar on the 22� Flag over Capitol stamp, so the data page has been revised again. Reports from others would be welcome. 11/4/03 - Gerald Blankenship, a PNC3 member and Vice President of the American Society for Philatelic Pages & Panels asked for and received a link to their club. Many of their members collect PNCs on Souvenir Pages. Click the above link or go to the 'Societies and Clubs' menu bar on the left. Rick Barbieri, the philatelic clerk in Reno, Nevada, sent updated information on his office. Contact Rick at rbarbieri@sdi.net or access the 'Reference' bar, go to Philatelic Offices and follow the prompts to Nevada. A recent question on the USStamps Group at Yahoo by Bob Rabinowitz prompted an answer from Zeb Vance and Richard Nazar concerning tagging on the 22� Flag over Capitol stamp. The result is an updated list of plate numbers with narrow and wide block tagging. 11/3/03 - Scott Publishing in the 2004 Specialized added a listing for an Imperf pair (die cutting omitted) on the 37� U. S. Flag. Jim Nelson informed me that two numbers, 4444 and 7777, have been found imperf. Jim also supplied a scan of the latter, which is also miscut. Scott also added an imperf listing to the Non-denominated U. S. Flag coil of 100. As the result of a suggestion by Scott Mix, I'll be adding an 'updated date' line to the data pages and the spread sheets. It will be on the bottom of the data pages to the right of the blue line (or underneath depending on your screen size), and at the very bottom of the spread sheets. A data page, with tentative information, is now online for the new Avery Dennison printing of the (10�) Atlas coil of 10,000 first reported by Donna Rajotte. Donna will be on vacation November 8 to 18. A conversation with Mel Lemmon, a supervisor at Stamp Fulfillment Services (SFS) in Kansas City, revealed that the new Atlas printing may have been available as early as October 21, although it was not in the system. Mel checked with customer services and it is being added today with an order number of 791241 for a coil of 10,000. At this time there is no order number for less than a full coil, and no word on First Day Covers. 11/1/03 - The 37� Snowy Egret stamps have arrived and are scanned for the data page. 10/31/03 - Rick Burdsall, Secretary and Webmaster of the American Plate Number Single Society sent the address of their new web site. The link also is located at the "Societies and Clubs' bar on the left. 10/30/03 - Steve Esrati writes that Al Haake has the V1111 Snowy Egret in hand. It should be showing up at your favorite dealer soon. This issue has caused a lot of confusion because the first digit is yellow and very hard to read. Bill McMurray advises that PNC exhibits won awards at the THAMESPEX 2003 Stamp Show. E. V. Chadwick won the Grand Award for the exhibit "The Electric Auto" which also earned a Gold and the United States Stamp Societies President's Award, the PNC3 Achievement Award and the PNC3 Presidents Award. Tony Bruno won a Vermeil for the exhibit "Plate Number Coil EFO's" which also earned the PNC3 Achievement Award and the EFOCC 2nd Place Award. THAMESPEX 2003 Stamp Show is sponsored by the Thames Stamp Club, and was held October 26, 2003 at the Waterford High School, Waterford, Connecticut. NEW AVERY DENNISON PRINTING: Donna Rajotte in Providence announces that she has in stock a new printing of the (10�) Atlas PSA coil of 10,000, with plate number V11111 every 10 stamps, and blue 5 digit middle back numbers every 10 stamps. She only has Position 6. Order USPS item number-791200. Some differences between this and the original BCA version: The colors on the Avery version are darker, including the black printing on the stamps (Atlas, Rockefeller Center, New York City; USA; and 2003). The original has a 2001 date. The original BCA perf gauge is 8.4 vertically. The Avery version is 11 vertically. The BCA plate number is B1111, Avery is V11111 (the V and the first 1 are green). 10/29/03 - The November 2000 issue of Coil Line is now online in the 'Reference' section. I'm looking for someone to compile an index of all the back issues. Any takers? 10/25/03 - Tom McFarland reports that he found the 37� Snowy Egret at the Mega Show with both P/V and V/P die cuts. In addition, Tom reports finding a Snowy Egret Valley/Peak roll with the 'bell' shape die cut that has been reported in Coil Line on the George Washington issue. 10/24/03 - Donna Rajotte in Providence announces that she has the 37� Snowmen PSA linerless coil of 100 with plate number G1112 every 12 stamps. Brian Engler called to report that the 37� Snowy Egret PSA coil of 100 exists with both P/V and V/P die cuts. He also gave me new information on the Lehigh Valley, PA philatelic office. 10/23/03 - Renate Fearonce in Tucson has the new holiday stamps and the 37� Snowy Egret PSA coil of 100 with plate V2111. No reports of V1111 at this time. Richard Nazar reports that his Microsoft Excel spreadsheet of basic PNC Catalog Numbers was updated on Oct. 22, 2003. Click here for the announcement. 10/22/03 - Bill Castle reports seeing a used 37� U. S. Flag with plate 9999 on cover dated 10/15/2003. Donna Rajotte in Providence now has them in stock and Steve Esrati says he can supply the 8888s and 9999s. 10/17/03 - Donna Rajotte in Providence has the new stamps that go on sale October 25th, including plate V2111 on the Snowy Egret. 10/16/03 - I'm back and there is a lot to catch up on. Please note that lot 349 has withdrawn from auction #29 because of an incomplete description of the lot. Renate Fearonce in Tucson has plate 8888 on the 37� U. S. Flag PSA coil of 100. She also has the Sennett 37� U.S. Flag 'Stick' stamps. Renate also sent a new inventory list. John Cropper found the 8888 mixed in flats with 3333 in his area (Richmond, KY) and I found nicely centered coils in Encino, CA. Oneco, CT also has the 8888. 10/1/03 - I'm off to California for a family visit and to attend SESCAL. In the event anything needs to be posted, I'll get John to add the item. Be back on the 15th. Lorelei Doering asked a question about data on the (10�) Green Bicycle. I have added additional information to the page as a result. Tom McFarland sent a scan of a 37� U.S. Flag with plate 8888 that he received in the mail. Click on the scan for a larger image. 9/30/03 - The October 2000 issue of Coil Line is now online in the 'Reference' section. 9/28/03 - Auction Director Joe Sedivy has the lots for PNC3 Auction #29 posted. The auction ends October 25 and you must be a member to bid. Click here for a text file and here for the bid form, or go to the 'Membership' bar for past auctions and/or to join the club. Joe asks that you please include your email on your bids. 9/24/03 - Anthony Willson sent updated information on the Van Nuys, CA Philatelic Office. Access the Philatelic list using the 'Reference' tab. 9/22/03 - Steve Unkrich wrote about some missing data and because of that, I have added back number intervals to the data pages for Scott 3208, 3266, 3280, 3282 and 3452. In addition, more detail on plate 3 of the $1 Seaplane has been added. Tentative technical details have been posted for the 37� Snowy Egret PSA coil of 100 to be issued October 24th. 9/20/03 - Bob Novak reports that plate 8888 on the 37� U. S. Flag PSA coil of 100 has surfaced. 9/18/03 - As of today, Ebay has added a "Plate Number Coils" category to their listing under United States Stamps. Thanks to everyone who wrote to Ebay to help get this new listing. Thanks also to Dan Neary, Director of Collectibles at Ebay for his effort on our behalf. A thank you note to Dan would be appreciated. Let's hope the new category gets lots of use. 9/17/03 - Ooops! Life member J D Coelho pointed out that on the 37c Flag comparison page, Scott# 3631 has a large 2002 date but on the date line I had it as 2003. 9/11/03 - Steve Esrati reports that plate V36 exists on the 23� George Washington SA coil of 100. The number has been added to the databases. Anthony Willson advises that a PNC3 regional meeting is scheduled for SESCAL on October 4th. SESCAL is being held at The Radisson Hotel at LAX (Los Angeles International Airport), 6225 West Century Blvd. The meeting will be held in California Room "C" and run from 10:00 a.m. to Noon. Jack Wasserman will host the meeting. On Saturday the Show runs from 10:00 a.m. to 6:00 p.m. Please bring news regarding new finds, etc. There will be time set aside also to share, sell, or trade PNCs. 9/7/03 - A miscut plate strip of three has been added to the 21� Bison data page. The miscut shows a closeup of the half-height die cuts in detail. Click here or go to the links at the bottom of the data page. At the suggestion of Ken Cherry, links to Coil Line articles have been added to the Purple Machine Cancels page in the 'Reference' section. 9/4/03 - Steve Unkrich notes that plate 11111 exists with lo-gloss gum on the 10� Eagle and Shield (Scott 2603). The number has been added to the 'notes' line. 9/2/03 - The September 2000 issue of Coil Line is now online in the 'Reference' section. 8/28/03 - Kevin O'Connor called my attention to a small error on the 5� BCA Seacoast data page. The "Paper & Gum" line said Self-Adhesive, but, of course, it's a Water Activated stamp, so it's been changed. Jim Nelson has been in contact with Otis Caldron, the USPS Philatelic Clerk in Columbus, Ohio. Otis advised that he received one case of the Sennett 37� U.S. Flag 'Stick' stamps and didn't expect it to last very long. Contact Otis at: USPS Philatelic Center, 6316 Nicholas Drive, Columbus, OH. 43235-9998. His phone number is 614-793-1725. 8/22/03 - Robert Rabinowitz sends word that plate V36 on the 23� George Washington SA coil of 100 has been reported. I'll hold off listing it until it is confirmed. 8/20/03 - A 37� U.S. Flag Comparison Page has been posted. The affected data pages also have a link to the comparison page. 8/19/03 - Scott Publishing Company has assigned #3632A to the PSA 37� U.S. Flag stamp from a coil of 100 printed by Sennett Security Products. Scott describes it as the "Flag lacking star points at top". I'll work up a comparison page tomorrow. 8/17/03 - Steve Esrati reports that Bill Korchik of Minnesota, a collector of used singles, has found two more copies of the 37� Snowman with the plate-number combination G1112. 8/12/03 - At Stampshow, Tom McFarland snapped a photo of Scott Adams, an "At Large" Officer. The scan is now on the Officers page. I picked up a stick of 5 coils of the Sennett Security reprint on the 37� U.S. Flag and have posted info and scans. Stick Scan. Tentative Data Page. Details Page. According to Kansas City, the order (item) number is 780142. 8/6/03 - A reminder that the PNC3 annual meeting is this Saturday. It will be held at 2 p.m. in room C115 of the Columbus Ohio Convention Center during Stampshow 2003. There is no meeting scheduled in that room following ours, so there should be plenty of time for swapping and selling. Bring your material along with you. Frank Covey will have a laptop and a scanner at the PNC3 table at Stampshow. If you will be at the show and have constant plate varieties or anything else that could be included in the catalog, please bring them along. We can also use some help staffing the table for a couple of hours. I hope to see everyone at the show and the meeting. 8/5/03 - Donna Rajotte in Providence has some new issues plus a restocking of the 1� Tiffany Lamp. 8/4/03 - Mike Lipson has an ad in the August 2003 issue of Coil Line that has an expiration date of July 31. Because of a mix-up on our part, the deadline has been extended. PNC3 members will receive an additional $5.00 discount on orders over $25.00 when ordering online. Valid for one purchase thru August 30, 2003. Click here for Mike's Web Site. 8/3/03 - A report from Steve Esrati: Al Haake has just found two untagged strips of five of the 18� Surrey from Plate 8. That's 22 years after the stamp was issued. Plate 8 was paired briefly with Plate 7, then with Plate 2. No untagged strips from any of the three had been previously reported. 8/1/03 - Thanks to Herbert Holmes for his proofreading efforts. As a result, the PNC listings that are in red on cream and on a blue background have been updated. These had been neglected for a while and are now up to date. The listings can be accessed from the 'PNC Data' bar by clicking on Checklists. 7/31/03 - The August 2000 issue of Coil Line is now online in the 'Reference' section. 7/29/03 - Word from Tucson that Renate Fearonce just received plate 7777 on the 37� U. S. Flag PSA coil of 100. 7/26/03 - Mike Lipson reports and Maurice Bessette in Oneco, CT confirms the existence of plate V46 on the 23� George Washington SA coil of 100 with both P/V and V/P die cuts. Both Renate Fearonce and Donna Rajotte sent emails with new items received. Renate also sent a new inventory and Donna has the 37� U. S. Flag PSA coil of 100 with plate 7777. 7/22/03 - Good news from Tucson. Read Renate's latest email. 7/17/03 - Scott Publishing Company has assigned #3785 to the (5�) Sea Coast stamp from a coil of 10,000 printed by Ashton Potter. This stamp has die cuts on all four sides. Numbers were also assigned to the (25�) American Eagle Presorted First Class stamps. The number range for the 10 stamps is 3792 to 3801, with #3801a being assigned to the strip of 10. The stamp with the plate number, the Gold Eagle with the Green background gets #3796. Donna Rajotte sent an email to alert her customers that the (25�) American Eagle coils with S2222222 that she sent out may in fact be S1111111. Donna says that on the coil with black back numbers the coil started with the S2s and changed to S1s, and she may have sent some out in error. I'm sure we will hear more about the reasons for the switch in plate numbers on the coil. The possibility exists that there might also be a splice on those rolls. 7/13/03 - PNC3 President Frank Covey states that he will have a laptop and a scanner at the PNC3 table at Stampshow in Columbus, Ohio, August 7 - 10. If you will be at the show and have constant plate varieties or anything else that could be included in the catalog, please bring them along. We can also use some help behind the table for a couple of hours. It's a great chance to meet other PNCers and help the club. A note from Ken Martin at APS headquarters indicates that the 2003 FIP Web Site Evaluations have been canceled. The note further indicated that they may resume in 2004. 7/10/03 - Donna Rajotte in Providence, RI reports that she has in stock plate S2222222 on the (25�) American Eagle coil of 10,000 in three different back number configurations. This is the first report of this new number. Donna says that the vertical bar shown below is also on these. 7/9/03 - It's been a while since I mentioned this, but the US Stamps discussion group on Yahoo has had quite a few messages lately about the American Eagle coil. The purpose of the list is to give collectors a forum to exchange information on modern US stamps. Reports on new varieties and printings, locations of various items, offers to buy, sell, and trade at cost are welcome. It's easy and free to sign on. Click on the link above. 7/2/03 - The (25�) American Eagle coil of 10,000 has been scanned and is on the data page. The scans also show the vertical bar printed on the liner back. See the item below from Doug Iams. 7/1/03 - Donna Rajotte in Providence, RI reports that she has in stock plates V24 and V35 on the 23� George Washington SA coil of 100 with both P/V and V/P die cuts. 6/30/03 - The July 2000 issue of Coil Line is now online in the 'Reference' section. 6/29/03 - Gene Trinks has found another die cut variety on the 5� Mountain SA. In addition to Plate V333323 with rounded corners which was reported earlier, Gene also found rounded corners on V333343. See the data page for details. 6/28/03 - Doug Iams reports that the (25�) American Eagle coil of 10,000 on sale at the Santa Clara first day has a new marking on the back of the liner. It is a thick vertical black line (a bit over 1.5 mm wide) that occurs every 20 stamps. It is behind the middle of every other stamp that has the green eagle on a gold background. More specifically, it is the one 5 stamps to the the left of the numbered stamp. This means that if you have a PS11 with the numbered stamp in the middle, the line will be behind the first stamp. Donna Rajotte in Providence confirms that her coils have the same back marking. I'll have scans when I get my order from Providence. 6/27/03 - Ebay has issued another list of preliminary changes to the stamps category and I'm happy to announce that they have included a separate listing for Plate Number Coils. Click here for the list. Thanks to everyone who contacted Ebay in this matter. No word yet on when it will go live. 6/25/03 - Donna Rajotte in Providence, RI reports that she has the (25�) American Eagle coil of 10,000 in stock with two different color back numbers. First Day of Issue is tomorrow. 6/19/03 - Robert Rabinowitz reports that plate V35 on the 23� George Washington SA coil of 100 has been confirmed with both P/V and V/P die cuts. 6/17/03 - According to Martin J. Frankevicz of Scott Publishing, an article will appear in the Catalogue Update section of the August 2003 Scott Stamp Monthly magazine that will discuss the plate number coil strip of 11 and plate number coil strip of 21 (both with the plate number single at the center of the strips) that will be listed for the ten 25c Eagle coils to be issued on June 26. Martin also states that "According to the information we have received about the Eagle coils (we have not yet seen the actual stamps), the Scott number that will be assigned to the first of the ten Eagle stamps will be for the stamp with a gold eagle on a slate blue background." Scott Publishing editor James Kloetzel adds "that the (Scott Catalogue) listings for Plate Number strips of the new 25c Eagle coil will be (1) PN strip of 11 with plate number on the center stamp (gold on green), and (2) PN strip of 21 with plate number on the center stamp." 6/14/03 - The US Postal Service announced today that a Snowy Egret stamp will be issued on October 24th at the fall Postage Stamp Mega-Event show at Jacob K. Javits Convention Center, in New York, N.Y. The Snowy Egret stamp will be issued in coils of 100 stamps, replacing the Antique Toys stamps coil. 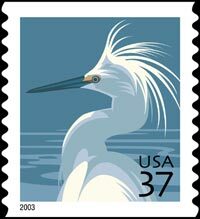 The stamp art, based on photographs, depicts the head and upper body of a snowy egret against a blue background. More technical information will be available later this year. 6/11/03 - A new die cut variety on the 32� Flag over Porch has been found by Jim Tod. It was first reported by Alan Thomson in the March 2003 Coil Line. As a result, Jim Fowler found another copy. The new discovery is plate 88888 with 11 x 12 valley/peak die cuts, Scott #2915C. Doug Iams has an article on the stamp in the June 2nd issue of Linn's. All the databases have been updated. 6/8/03 - The results of our PNC3 auction #28 which ended May 24, 2003 are now posted online. All the auction information can be accessed by using the 'Membership' button, or by clicking here. Thanks to Auctioneer Joe Sedivy for another successful auction. 6/6/03 - Donna Rajotte in Providence, RI reports that she has the BCA version of the 37� US Flag PSA coil of 100 in stock. Plate B1111 every 12 stamps. 6/5/03 - eBay bidder DJSCHULTZ won the 37c Snowman used single with plate G1112 that was being offered by Mike Lipson with one second left on the clock. The winning price was $155.00. Robert Rabinowitz reports that plate 7777 on the 37� U. S. Flag PSA coil of 100 has been confirmed. 6/4/03 - Thanks to Mike Lipson we have scans of the new version of the Sea Coast coil of 10,000 printed by Ashton Potter. Note that this stamp has die cuts on all four sides and the date is 2003 in black. The plate number is P1111. The link above will take you to a scan of a strip of stamps, the reverse side with a back number and the cardboard 'frisbee'. Mike discovered toward the center of the coil that the back numbers became 3 digits and then 2 digits. The data page has the tentative information that I have available. Order numbers are: Coil of 10,000, 781441; Strip of 25, 781431 (Note change of numbers - Thanks to Bob Rabinowitz for the correct numbers). According to a USPS spokesperson, the official date of issue is June 3, 2003. 6/2/03 - Renate Fearonce in Tucson AZ advises that the letter writing campaign has been effective and asks that no more letters be sent to postal officials. 6/1/03 - The June 2000 issue of Coil Line is now online in the 'Reference' section. 5/31/03 - Mike Lipson reports that Ashton Potter released a 5� Sea Coast SA 10K coil. It has plate number P1111 and the stamp is die cut on all four sides. Plate numbers are 22 stamps apart; Back Numbers are 20 stamps apart and are blue or aqua, giant size and upsidedown. I calculate #on# to take 220 stamps. Year date of 2003. Expect odd and even rolls ala Stamp Ventures WA coils. USPS order number is the same as BCA, 7814. The year date was observed on this one coil roll to be lighter every 22 stamps. I don't know the relationship of the light year date to plate number. More information as it is available. Additional details on the (25�) American Eagle coil of 10,000 to be issued June 26 are now posted. 5/26/03 - Mike Lipson announces that he now has a web site. Click HERE or go to the 'Collecting PNCs' bar on the left. Joann Lenz sent word that three offices in Michigan, Detroit, Royal Oak and Westland no longer have philatelic windows. Conrad Keydel filled in information on the other Michigan offices. 5/23/03 - Technical details on the (25�) American Eagle coil of 10,000 to be issued June 26 are now posted. What we know so far is on the data page. I have been told that the plate number will be on the Gold Eagle stamp with the Green background, which is the stamp on the far right in the scan below. Donna Rajotte in Providence, RI sent an email with her latest new items. No coils, 2 booklets and a new email address: rhode.p.istamps@usps.gov. 5/21/03 - Renate Fearonce in Tucson AZ advises that she will be on vacation May 22nd through the 29th. 5/13/03 - Renate Fearonce in Tucson AZ sent an email with the latest developments in her effort to keep the philatelic office open. Your help is still needed. The US Postal Service has released an updated 2003 stamp schedule in Word format. 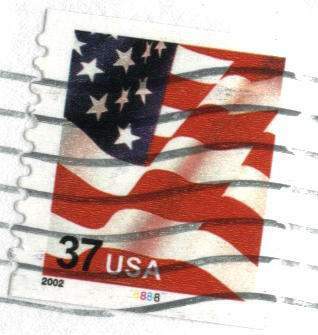 5/12/03 - Scott Publishing has assigned catalog number 3633A to the BCA version of the 37� US Flag PSA coil of 100 serpentine die cut 8 1/2 vertical, with right angle corners. The 10,00 BCA coil is 3633. 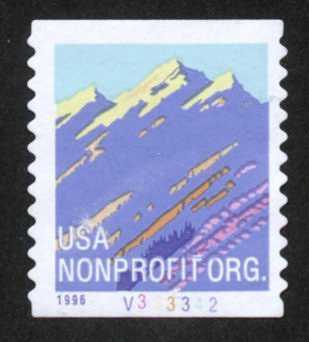 The new number will appear in the July 2003 issue of Scott Stamp Monthly. 5/11/03 - There have been a couple of reports that the 37� U. S. Flag PSA coil of 100 exists with plate 7777. So far, there have been none confirmed. The reports were in error. 5/1/03 - The May 2000 issue of Coil Line is now online in the 'Reference' section. Renate Fearonce in Tucson AZ is still looking for support and sends an update. 4/30/03 - Shown below is preliminary USPS artwork for 10 designs of a new 'Presorted First Class' set of stamps in a coil of 10,000. The nondenominated 25� Eagle coil will be printed by Sennett Security Products and probably released at the ASDA Stamp Show in Santa Clara, California on June 26. The stamps will more than likely have space between them on the liner. Thanks to the ASDA for the artwork. Click on the scan for a larger picture. 4/29/03 - Donald Smeraldi of the US Postal Service sent technical details of the BCA version of the 37� US Flag PSA coil of 100 via Steve Esrati and they are now posted. Past President Gene Trinks sends details of the annual PNC3 meeting, which will be held at the APS Stampshow in Columbus, Ohio on Saturday, August 9. The board meeting will be at 9am in room D140 and the annual meeting will be 2pm till 4pm in room C115. 4/28/03 - Mike Lipson has submitted a candidate for the EKU on the BCA version of the 37� US Flag PSA coil of 100. The cover, sent to himself, is dated April 24, 2003. 4/24/03 - The BCA version of the 37� US Flag PSA coil of 100 is in and scanned. There are no technical details available, so information on the data page is still tentative. Don't forget the PNC3 regional meeting this Saturday at the Plymouth, MI show. President Frank Covey will be the featured speaker. Donna Rajotte in Providence, RI sent an email with her latest new items. 4/23/03 - Is it possible that philatelic services in Tucson, AZ could be greatly curtailed or shut down completely? Read the chilling email from Renate Fearonce to see what is going on. In the issue of Linn's Stamp News dated April 28, 2003, Rick Miller covers coil stamps in the 'Refresher Course' column. PNC3 and the web site are mentioned with contact information. John Larson has a great article on 'USPS Philatelic Services on the Internet' in the April 2003 issue of the 'The United States Specialist', the monthly publication of the United States Stamp Society. The article primarily covers Tucson and Providence and has several references to the PNC3 web site. 4/18/03- Robert Rabinowitz reports that the BCA version of the 37� US Flag PSA coil of 100 is available from the 'cave' in Kansas City. The order number is #780141. The plate number, B1111, repeats every 12 stamps and the year date is 2003. Donna Rajotte in Providence, RI reports she has the 37� U. S. Flag PSA coil of 100 with plate 6666 in stock. 4/16/03 - Recent discussions on the US Stamps message board point up the problems with trying to tell the difference between Peak/Valley and Valley/Peak Avery Dennison die cut stamps. Mike Lipson sent a scan and I added that to mine and came up with a comparison page to help sort it out. A link has been added to the 'Reference' bar. Alan Thomson gave us permission to reproduce his May 2001 Coil Line article on the die cut varieties. 4/15/03 - Auction Director Joe Sedivy has the lots for PNC3 Auction #28 posted. The auction ends May 24 and you must be a member to bid. Click here for the lots in Works format or here for a text file and here for the bid form, or go to the 'Membership' bar for past auctions or to join the club. Steve Esrati reports that the following plate numbers, V13, V21, and V24, are in his stock on the 23� George Washington self adhesive. The last number, V24, had been reported but not located. It's being added to the database. Scott Publishing has assigned catalog number 3775 to the (5�) Sea Coast water-activated coil stamp. Dennis Ladd spotted an error on the checklists. The 5.9� Bicycle (Scott 1901) is now listed correctly as Overall tagged. The data page was right and has not changed. 4/11/03 - Donna Rajotte in Providence, RI and Renate Fearonce in Tucson, AZ sent emails with new (older) items listed. Renate also has news about the 23� George Washington. Richard Nazar has a web site with his "PNC Catalog Numbering System". The site features a complete description of the PNC Catalog Numbering System and includes an up-to-date Microsoft Excel spreadsheet of the basic PNC Catalog Numbers. Part 2 of The PNC Catalog Numbering System description includes explanations for extending the basic PNC Catalog Numbers for varieties and errors. There is a link on the 'Online Resources' bar, or use the one above. Be aware that this numbering system is an updated version of the system used in the previous edition of The Plate Number Coil Catalog and is not the same as the one being promoted by the PNC3 club for our catalog. 4/9/03 - Reports are circulating that Banknote Corporation of America will produce coils of 100 of the current PSA 37� U.S. Flag. Reports also indicate that Sennett Security Products will print a Nondenominated 25� presorted first-class Eagle coil in rolls of 10,000. More details as they become available. 4/3/03 - Craig Selig reports the appearance of the 37� U. S. Flag PSA coil of 100 with plate 6666. The new number has been added to the database. 4/1/03 - Renate Fearonce in Tucson reports that she has the 37� U. S. Flag coil with plate 5555, and the 23� George Washington PSA coil of 100 with plate V21. 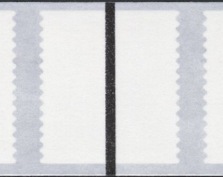 Both Renate Fearonce and Donna Rajotte have confirmed in answer to my question that the 23� Washington's with plate V13 and V21 are available with Peak/Valley and Valley/Peak die cuts. The April 2000 issue of Coil Line is now online in the 'Reference' section. In addition, I've added the 1999 index. 3/31/03 - John Bodley pointed out through Steve Esrati that the checklists had the wrong information on the 5.5� Star Route Truck stamp. The unprecancelled stamp is Block Tagged, not Untagged as was listed. The change has been made. 3/29/03 - Donna Rajotte in Providence, RI reports she has in stock a new number, V13, on the 23� George Washington PSA coil of 100. Robert Rabinowitz reports that reliable sources have seen V21 and V24. Bob wonders if V23 is also out there somewhere. These new numbers have been added to the database. Renate Fearonce in Tucson reports that she has the 10,000 coil of the water activated (5�) Sea Coast stamp. 3/24/03 - The (5�) Sea Coast water-activated coil stamp is in and has been scanned. Coils of 500 have 3 digit pink back numbers, while coils of 10,000 have 5 digit numbers. All back numbers so far are 3 stamps to the right of the plate numbered stamp. 3/22/03 - PNC3 auctioneer Joe Sedivy sent notice that all lots for the next club auction must be in the mail to him by March 24th. Anything mailed after that date will be held until the next auction. We will post the lots on the site when we receive them from Joe. 3/19/03 - Today is the First Day of Issue for the (5�) Sea Coast water-activated coil of 500 and 10,000. Both Internet Philatelic Clerks, Donna Rajotte and Renate Fearonce have the stamp in coils of 500. The back number is a 3 digit pink, every 10 stamps, top or bottom in position 6, which puts it on a strip of 7, but not a strip of 5. Both ladies also have a few more recent items that just came in. 3/18/03 - Lorelei Doering has found another perforation variety on the water activated (10�) NYC Library Lion stamp. On this new find, there is one large perf hole in the center of the row of smaller holes to the right of the numbered stamp. Both coils of 500 and 3000 exhibited this variety. Click on the scan to access the comparison page. Scott Publishing has assigned catalog number 3757 to the 1� Tiffany Lamp water-activated coil stamp. 3/17/03 - Dan Kauffman suggested that we add Inverted and Reversed die cuts to the glossary and it has been done. The link is in the 'Reference' bar. 3/15/03 - This is a scan of only the second reported copy of this plate number, G1112 on the 37� Snowmen coil. 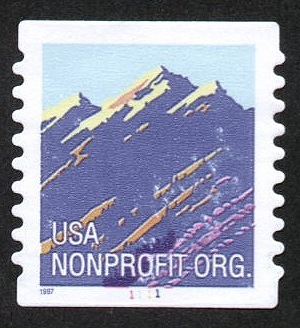 This stamp is owned by Mike Lipson, but he states that he did not discover it. So far, no mint copies have been reported. Click on the scan for a larger version. 3/14/03 - Richard Nazar reworked some of the photos on the Officers page. 3/13/03 - In addition to the die cut variety reported here last month on the 7 year old 5� Mountain Self Adhesive with Plate V333342, there is now another variety just discovered yesterday. Click on the link above or here to go directly to the new information. 3/12/03 - Donna Rajotte in Providence, RI reports that she has a new supply of the 1� Tiffany Lamp water-activated coil of 3000 in stock with back number positions 1, 3 (# on #) and 5, in addition to previously reported positions 2 and 4. She also has some with the pink back number in the middle of the stamp. 3/6/03 - The 1� Tiffany Lamp water-activated coil stamp is in and has been scanned. 3/4/03 - Thanks to Richard Nazar for reworking and transforming the PNC3 logo in the upper left corner of this page to a sharp, clean version. 3/1/03 - Today is the First Day of Issue for the 1� Tiffany Lamp water-activated coil of 3000. Donna Rajotte in Providence has a supply of the 3000 coils. Click the link for details. The March 2000 issue of Coil Line is now online in the 'Reference' section. 2/28/03 - Donna Rajotte in Providence, RI reports that she has the 1� Tiffany Lamp water-activated coil of 3000 in stock with back number positions 2 and 4. Renate Fearonce in Tucson reports that she has the 3000 coil of the water activated (10�) New York Library Lion with # on #. Renate also sent along her latest inventory list and a note about future emails. 2/25/03 - Arthur Westneat called my attention to the discovery by Ken Moreau of a Tagging Omitted error on the 2� Locomotive #8. It is listed as Scott #1897Ad. The data page has been updated and the minor letter on the Imperf variety has been changed to "c". The following data pages and related lists have been updated to agree with the 2003 Scott Specialized: 25� Honeybee - broke out small and large block tagging and added minor letters f, g and h, plus added scans of some varieties; 10� Tractor Trailer - add letter b for a full color omitted in a transition strip. Donna Rajotte in Providence, RI reports that she has a new supply of the 5� Butte WAG with plates S111, S222 and S333, plus the 37� U. S. Flag coil with plates 2222 and 5555. 2/24/03 - Joe Sedivy, our Auctioneer, and Anthony Willson, our Regional Meetings Chairperson both sent in a photo and they are now included on the Officers page, which can be accessed from the 'Membership' menu bar. 2/19/03 - We have the Technical Details that the Postal Service released today on the (5�) Nondenominated Water Activated Sea Coast coil. The stamps will be issued March 19 in Washington, DC in coils of 500 and 10,000. 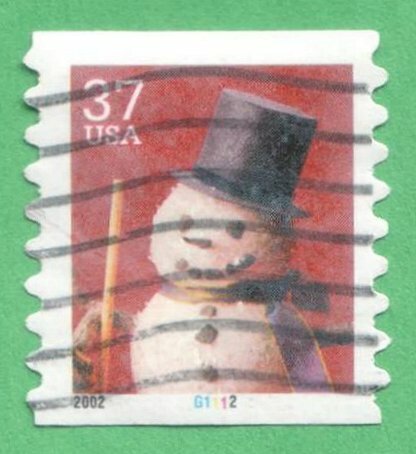 2/18/03 - Alan Thomson has confirmed the find of a single used stamp of the 37� Snowmen coil with plate # G1112. Robert Rabinowitz reports plate # 5555 on the 37� U. S. Flag coil. 2/17/03 - Scott Publishing has assigned catalog number 3769 to the water activated (10�) NYC Library Lion stamp. All data pages have been updated. 2/16/03 - Ebay is proposing changes to its United States listings. They are looking for suggestions and comments. It's possible that they might establish a category for Plate Number Coils if they get enough correspondence. The list of proposed changes is at http://pages.ebay.com/catpreview/stamps.html. The email address for comments is on that page or go directly there with collectibles@ebay.com. Steve Esrati reports the existence of Large and Small hole perforations on the water activated (10�) NYC Library Lion coils. Early reports indicate that Large holes are from coils of 500 and 3000 while Small holes are from coils of 3000. Click here for a comparison scan. 2/15/03 - Robert Washburn wrote to update the Purple Machine Cancel list. Add the tagged 9.3� Mail Wagon #1 which was found tied to a post card. Donna Rajotte in Providence, RI reports that she has the 5� Butte WAG 3k plate S111 every 14, pink top/bottom back numbers every 10, odd, 70 stamps for positions 2 and 4 only, USPS item number-793300. 2/14/03 - Scans of two newly discovered die cut varieties, first reported by Rob Washburn, are shown here. On the left is the Avery Dennison Self Adhesive with Plate V333342 with 13 x 12 PP/VV die cuts. All four of the other plate combinations have this configuration, but until recently, this number was know only as 'inverted'. On the right is the BEP version with 9 x 10 VV/PP die cuts. Normal is 10 x 10 PV/VP. Both data pages have been updated. Stamps courtesy of Jim Nelson. Click on scans for a larger view. 2/12/03 - Victor Kuil has been busy proofreading, so I've made a few more changes. Scott #2452a, the 5� Circus Wagon, has been changed to conform to the Scott assigned numbers. Plate numbers have been added to the Tagging Omitted version of the 25� Flag over Yosemite. Plate numbers 3 thru 6, which disappeared, have been reinserted in the data page for the 9.3� Mail Wagon. 2/11/03 - The scan of the (10�) New York Library Lion water-activated coil is now on the data page. 2/9/03 - For the second year in a row, the PNC3 web site has been honored by the International Association of Webmasters and Designers. We are proud to announce that we have received the "Golden Web Award" for 2003-2004 which is issued "In recognition of creativity, integrity and excellence on the Web". 2/6/03 - As a result of a few errors in the Postal Bulletin, I have corrected data on the following Self-Adhesive pages: 10� Green Bicycle, 33� City Flag and 34� Statue of Liberty. All were printed from plates of 378 stamps. I have also combined the 3k and 10k pages on the 34� Statue of Liberty. Thanks to Ray Beer for bringing this to my attention. If I'm wrong about the 378, please let me know. 2/5/03 - A half dozen or more terms have been added to the 'Glossary' and several more have been redefined. It's in the 'Reference' section if you wish to check. Renate Fearonce in Tucson reports that she has the 500 coils of the water activated (10�) New York Library Lion. She has both Top and Bottom pink back #s and they are # on #. She also has a new variety on the PSA 10K coil of the Library Lion with plate S33333. It has BLACK middle back numbers. Click here for her email. 2/4/03 - Thanks to Conrad Keydel who pointed out that the current Philatelic Catalog has 2 coil sizes of the 2� Woodpecker listed. I have changed the data pages. Does anyone know if there are differences between the two? Today is the First Day of Issue for the (10�) New York Library Lion water-activated coils of 500 and 3000. Donna Rajotte in Providence has a supply of both the 500 and 3000 coils. Click the link for details. Renate Fearonce in Tucson sent her latest Inventory List. Click here for the Excel file. The February 2000 issue of Coil Line is now online in the 'Reference' section. 2/3/03 - I received my copy of the new PNC3 Catalog Sampler in the mail today. See the January 2003 issue of Coil Line for details on ordering or email the Catalog Committee. 2/2/03 - Thanks to the sharp eye of Victor Kuil, I have posted missing information on the Tagged Error (Scott #2607a) on the 23� 'Chromed' USA Flag. 2/1/03 - Tentative technical details for the 1� Tiffany Lamp water-activated coil of 3000 to be issued March 1 have been posted. 1/29/03 - A Regional PNC3 Meeting will be held this coming Saturday, February 1, at the Sarasota 50th Anniversary Exhibition. The meeting will be at 10 a.m. in the North Lobby of the Municipal Auditorium. Contact Fred P. Sener at FSEN213@aol.com for more information. 1/26/03 - Technical details for the (10�) New York Library Lion water-activated coils of 500 and 3000 to be issued February 4 have been posted. 1/18/03 - A number of PNC collectors have resurrected a Coil Label Study Group. If you are interested or just curious, visit their information page. 1/12/03 - I received word today that a Regional Meeting is planned again this year at the Plymouth Show April 26. Frank Covey is slated to speak about the new catalog. 1/10/03 - This will serve as a reminder of two Regional Meetings before the end of the month. The first is at Orcoexpo in Garden Grove, California on January 18 and the second is at Aripex in Tucson, Arizona on January 25. 1/8/03 - The postal service today issued technical details on the upcoming water-activated New York Library Lion coils of 500 and 3000. Click here to view the data. 1/2/03 - Renate Fearonce in Tucson sent an email with the news that she has a couple newer numbers. She has plate S33333 on the (10�) 10k New York Library Lion and plate 4444 on the 37� U.S. Flag coil of 100. Renate also has some plate number strips of 5 for sale. Click here for the list. 1/1/03 - The January 2000 issue of Coil Line is now online in the 'Reference' section. Renate Fearonce in Tucson sent a new inventory of items she has available. Access it from the 'Online Resources' section. Please send corrections and comments to our webmaster.